Has Europe Declared War on the US Dollar? Footprints lead to London Market Attack. When Jean-Claude Juncker, Luxembourg's premier and the chair of Europe's finance ministers, announced on April 23 that "financial markets and other actors [had not] correctly and entirely understood the message of the [recent] G7 meeting," his words went essentially unheeded. The Daily Telegraph's Ambrose Evans-Pritchard put that message in clear language. "[Juncker], he said, "has given the clearest warning to date that the world authorities may take action to halt the collapse of the dollar and undercut commodity speculation by hedge funds." Prior to Juncker's comments French Finance Minister Christine Lagarde likened the recent G-7 stance to the 1985 Plaza Accord when the industrialized nations agreed to "coordinated intervention" to drive down the dollar. When asked whether the G7 statement might hint at a new coordinated intervention, Lagarde replied "the future will tell." Behind the explicit message to the hedge funds and other "actors," stood an implicit message to the United States: The rapid decline of the dollar was about to be challenged. Europe would no longer tolerate its effect on European industry. Europe, in effect, was declaring war on the weak U.S. dollar. As you can see, there is a discernible pattern in both charts. The last four sharp declines in the euro and gold have occurred at precisely 2AM Mountain time, or 9AM London time -- the first clue that these might not be random market events. The most recent (May 1) followed the announcement by the Fed it was lowering interest rates and that it stood ready to lower them further in the weeks to come. Adding to the intrigue, the first two instances appear to have been successful attempts to keep the euro from transcending the $1.60 mark. These events, carried out in the London market in each instance at the open, go beyond giving the appearance of something unusual going on in the dollar/euro market. It seems that someone is intent on delivering a message, and that someone could very well be the European Union. So what might all of this mean for gold? The second chart above shows the lockstep relationship between gold and the euro since the first signs of intervention on April 18. Obviously, gold has been hurt by the dollar/euro action, but I do not believe that Europe is directly attacking gold. Its interest is in the euro. Instead gold is suffering collateral damage tracking lower as the dollar has tracked higher. It remains to be seen if gold will continue its lockstep relationship with the euro in the future particularly if it becomes generally known that what we are witnessing is indeed a coordinated, official-sector policy. You will find some details on this below. 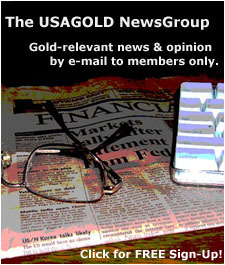 If you would like to broaden your view of gold market news and analysis, please feel welcome to join our free NewsGroup to receive by e-mail periodic gold news alerts, USAGOLD Market Updates, and relevant commentary like this one! And what might lead to a bottom for gold and a turnaround scenario? First, unless Europe is prepared to peg the euro to the dollar the way China and some of the Gulf states have, this policy is doomed to failure. Market forces far outweigh whatever headway Europe can gain by executing an interventionist currency policy. If they do implement a de facto peg, or try to manage the euro within a band, Europe will become subject to the same inflationary pressures now present in the countries which have pegged their currency to the dollar. In addition, it could abandon hope of the euro ever becoming a viable alternative to the dollar. It would instead become a proxy for the dollar. Thus, the most likely scenario is that Europe's intervention simply runs out of gas. Second, the United States could retaliate by launching an intervention of its own. Short of that, it could simply sit back and allow the current trends to play themselves out. Eventually, the dollar decline would reassert itself based on fundamentals, i.e., the growing trade and fiscal deficits, central bank bailouts of the banking system, etc. As Mark Gilbert points out in a recent Business Day opinion piece, "As each new level has given way this year - $US1.50 was breached in February, $US1.55 was beaten in March, and $US1.60 was finally surpassed last week, albeit briefly - the cries of anguish from the euro region have gotten louder. Concomitantly, the silence from the US administration has remained at its default deafening volume. Try as they might, those who would brake the dollar's decline are doomed to fail in the face of almost total US indifference." Third, highly capitalized money managers around the world with a high degree of leverage still at their disposal could come to the realization that the currency and trade wars make all fiat money vulnerable. The march in commodities and gold might gain, not lose, momentum if some of the "actors" Juncker mentions come to see Europe's intervention as a bluff in the high stakes international currency game. One wonders how aggressive Europe can afford to be under the circumstances. Market interventions rarely work. In the end, they tend to create more problems than they solve. This intervention, like most of its predecessors, is likely to be viewed down the road as containing more short-term bluster than long-term substance. Once the pressure is released, which inevitably will be the case, the gold and euro markets are likely to move rapidly and forcefully in the direction opposite the control. Note: GMT = Greenwich Mean Time. To verify chart times, go to the USAGOLD Live page. Under the 'Time Scale' pull down menu, select '30 minutes' Under the 'View' menu, go to 'Periods' and change the entry to '500.' Click 'OK.' Under the 'View' menu choose 'Information.' Move the pointer to the areas indicated on the accompanying chart and the time will automatically appear in the 'Information' box wherever you put the crosshairs. Greenwich Mean Time is 7 hours ahead of the Mountain Daylight Time indicated. Michael Kosares has over 30 years experience in the gold business, and is the author of The ABCs of Gold Investing: How to Protect and Build Your Wealth with Gold , and numerous magazine and internet articles and essays. He is frequently interviewed in the financial press and is well-known for his on-going commentary on the gold market and its economic, political and financial underpinnings.